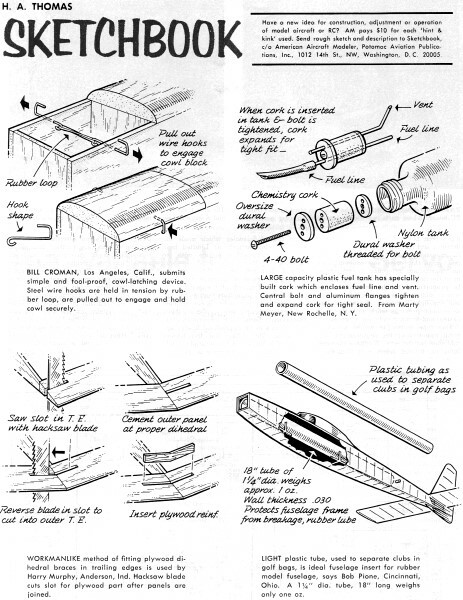 This Sketchbook was scanned from the February 1968 American Aircraft Modeler, page 44. 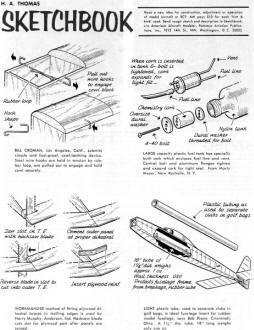 Most building tips are timeless. 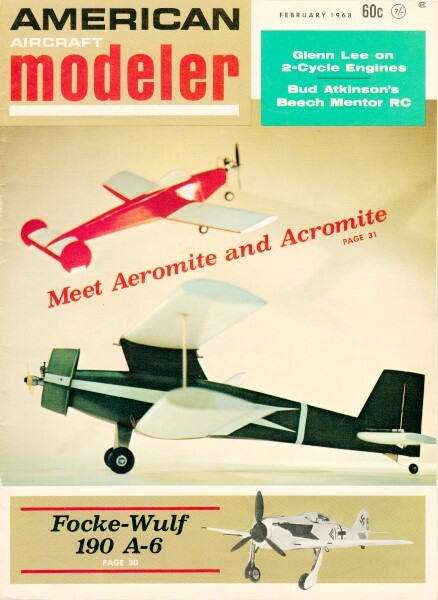 Even in this era of ready-to-fly (RTF), almost-ready-to-fly (ARF), bind-and-fly (BAF), etc., there are still many modelers who build their own aircraft. Nearly all top tier competition fliers build their own models, as do aficionados of vintage (aka old-timer) models. Some guys just would rather build than buy a pre-build airplane, whether from a kit or from plans. This page has links to every edition of Sketchbook that I have so far. Back when the Sketchbook, Gadgetry, Powerless Pointers, and Engine Info columns were run, there were very few pre-built models, and there simply was not as much available in the way of hardware and specialized modeling tools. We were still a nation of designers and builders. The workforce was full of people who worked on production lines, built houses and buildings with hand tools, and did not have distractions like Nintendos and X-Boxes. Remember that plastics were not common material until the early 50s and the transistor wasn't invented until late 47. Enjoy the tips. Some of you will no doubt wax nostalgic over the methods, since you can remember the days when you did the exact same thing!